Red5 Audio are just one of several companies delivering good-quality microphones at low prices thanks to the economical benefits of Far East manufacturing. We've reviewed their large-diaphragm capacitor mics in the past, but they've since added a comprehensive drum mic set to their range, comprising a dedicated dynamic kick-drum mic, four dynamic snare/tom-tom mics, and a pair of capacitor pencil mics for use as overheads. All seven mics come in a nicely presented flightcase with accessories, including drum rim clamps for the four snare/tom mics. A mini tripod for the kick mic is available as a cost option. The kit also includes foam wind shields for the two capacitor mics. The RVD1 kick mic is a suitably bulky and 'military' looking dynamic, cardioid model and includes an integral swivel mount with an adequately secure screw tightener. The output is the usual balanced XLR, in this case featuring gold-plated pins, and, as with most kick mics, the frequency response plot looks like a donkey's back leg! This is intentional, as the response is peaked up at 80-90Hz to emphasise the thump of the drum, with a further presence peak around 3-10kHz to bring out the percussive attack of the sound. The response drops away fairly briskly above 10kHz, and the mic is also less sensitive than typical general-purpose models to help compensate for the high-volume environment in which it will be used. It has a fairly broad cardioid pattern that comes about halfway between a cardioid and an omni pattern. By contrast, the RVD9 snare/tom mic has a fairly tight cardioid pattern that leans towards hypercardioid. 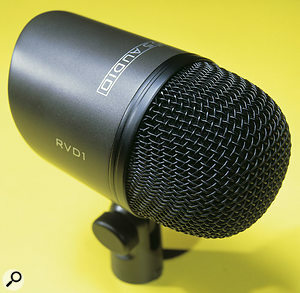 Again, it features an integral swivel mount and XLR output. This mic is nominally flat up to around 3kHz, then there's a well-defined presence boost to bring out the attack of the drums and the snap of the snares. The response tails off above 16kHz and below 50Hz, and, like the kick mic, the sensitivity is fairly modest to make up for it being used close to loud sound sources. In my tests, the kick and snare mics produced plenty of level, and you could just about get away without overloading the front end of a mixer not fitted with a pad switch. Unlike the other mics, the overheads are capacitor models, and will run from phantom power or from an internal 1.5V AA battery. They follow the usual pencil mic design and come with separate plastic mic clips rather than integral mounts. These have a nominal cardioid pickup pattern and a flat response useful up to 20Hz. They're more sensitive than the dynamic models, as you'd expect, and they translate the high-frequency detail of cymbals far better than dynamic models would. The foam wind shields serve little or no purpose when the mics are being used as drum overheads and so are probably best left off. The RVD1 kick-drum mic is also part of the set, and there is a miniature tripod floor stand available as a cost option for it.Photo: Mark EwingThe mounting hardware is interesting, as it comprises a rim clamp supporting a slightly curving upright support, into which is cut a slot so that the mic mounting point can be moved. By juggling the mic position and angle, the traditional mic placement of a couple of inches in from the rim and an inch or two from the head can be achieved, though the extra length incurred when an XLR cable is fitted means you have to be careful not to put things in the drummer's way. Angled XLR cables would help to some extent, but care in positioning is still needed. In practice, these clamps work fine provided that the drum rims aren't too deep, in which case they may not open far enough to clamp on. The little tripod for use with the kick drum mic may be OK for sitting the mic in front of the drum, but in most rock and pop applications, the mic should be positioned inside the bass drum via a hole cut in the front head. A low boom stand is more appropriate for this purpose, so the tripod is of limited use. I used the complete kit to record a good drummer who was fastidious about tuning his kit and, given the low UK price of this mic set, the results were excellent. The overheads picked up a good impression of the overall kit sound, with plenty of sparkle to the cymbals, while the tom and snare mics captured the essential drum sound and hyped up the top end in a useful way. I felt the kick mic lacked a little depth compared to its more costly counterparts, but it certainly wasn't bad, and it did combine the familiar 80Hz punch with some welcome presence. The mounting hardware was effective, if a little bulky, but overall setting up was easy and it didn't take long to get a good sound. There is an old adage that you get what you pay for, but when it comes to microphones you often seem to be getting more than you pay for, and such is the case here. 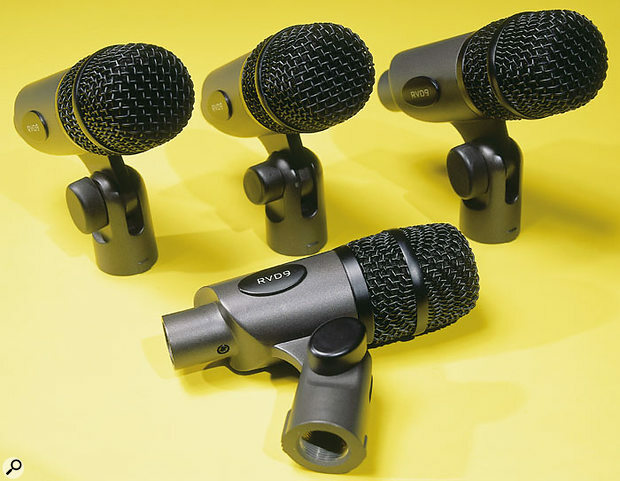 While more costly 'professional' mics will turn in better results, these mics can be used to make very good recordings, and they are also well suited to live performance. The mics make it easy to get a better-than-average drum sound, they look solid, and they come complete with mounting hardware and a flightcase, which saves on mic stands. As I observed earlier, the mounting hardware could have been more compact, and you really need to buy mic leads with angled cables, especially if the drummer likes his cymbals low, but that's no problem. At the price, this mic set is hard to fault. Rim mounting hardware is slightly cumbersome and may not fit on deeper rims. Kick mic not as weighty sounding as it could be. Good all round performance plus a comprehensive range of hardware at a budget price. Good for both live and studio applications. RVK6 £199; miniature tripod stand £12. Prices include VAT.